MamaEatsClean: Sugar-free, Grain-free, Low Carb Chocolate Muffins - Oh Yeah! 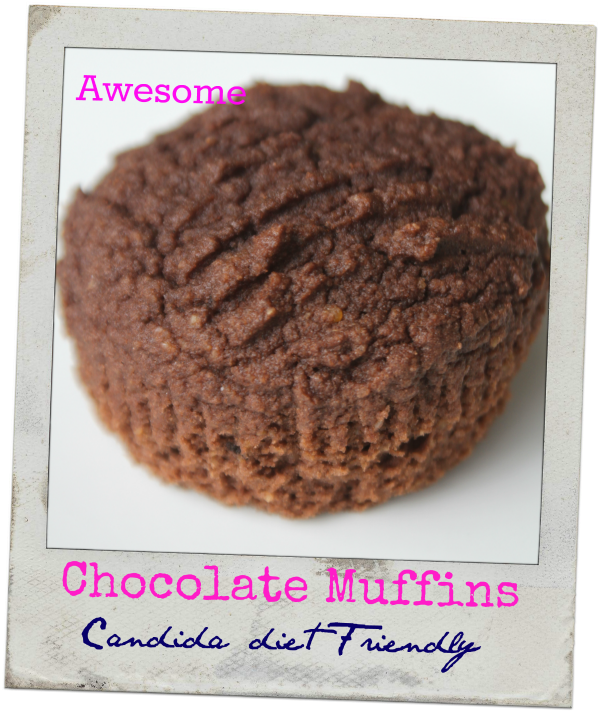 Sugar-free, Grain-free, Low Carb Chocolate Muffins - Oh Yeah! I have been on a bit of a muffin baking frenzy lately. I am finding it really hard to keep myself full and in snacks on this Candida diet. Its tricky. I'm already getting sick of eggs (eek). I eat two smoothies a day. And veggies are hard to snack on ALL THE TIME. Especially without ready made dip. So I have been experimenting. Lots. Some batches have been okay. Some batches have been good. But this batch was AWESOME. I say that in a totally grain-free, sugar-free, dairy-free, low carb kind of way. Revise your expectations if you are new to this way of eating and you will be much happier. They won't be selling these at Tim Hortons but I really enjoyed them (with a caveat below). The texture was amazing. Dare I say almost like a "normal" muffin. This is usually my issue with Paleo-style baking. That being said, I did use Xylitol. It is a sugar substitute that is pretty readily available (I've seen it at Bulk Barn and Vita Health in Winnipeg). And it tastes a lot sweeter and more natural than Stevia. But, and a big BUT, my system didn't like it. I got a Xylitol headache about 2 hours after eating these. Two days in a row - actually three - I ate it again even though I knew the consequences - they were that good. But I decided to still go ahead and share this recipe because lots of people can handle Xylitol just fine. Dr. Davis of Wheat Belly fame is a huge fan. The Candida guru's can't seem to decide. Just listen to your own body. I happen to be a rare, unique and sensitive creature. Its not working for me but it might work for you. And this base recipe was awesome so I'm going to try it again with some Stevia and a few tweaks and see what happens. I say this was a snack food but we all really know that I'm just trying to make a dessert disguised as a snack..............Frankly these wouldn't be bad with some coconut milk frosting now would they. Candida cupcake anyone? Separate egg yolk and egg white into two separate mixing bowls. Add vanilla, coconut milk, coconut oil and Xylitol to egg yolks. Mix to combine. Place about 1/4 cup of batter into each muffin liner. Smooth out the top of each one with the back of a spoon. Do you have the recipe for your home made coconut ice cream on your website? I can't find it? Hey there, Sorry I have never jotted it down. When I made it last I think this is what I did - I mixed 1 cup of full fat coconut milk, 1 cup of almond milk, 1 tbsp of almond butter, 6 drops of Stevia and 1 tsp of arrowroot. I put it in my Cuisinart ice cream maker. I'll try it again soon and document the recipe in my Recipage. How did you modify these with the stevia? I use a liquid stevia by sweatleaf, but was gonna there powdered one, or if there's one you know of.. I'm in the really strict fase of the Candida diet too, and can't deal with Xylitol. Thanks! I seem to get headaches with Xylitol. So I have been using Truvia (which is a blend of powdered Stevia and Erythritol). You can buy it at most major grocers. I would probably use 2 - 3 tbsps for 12 muffins. The liquid Stevia doesn't seem to hold its sweetness in baking so I've gotten away from it.